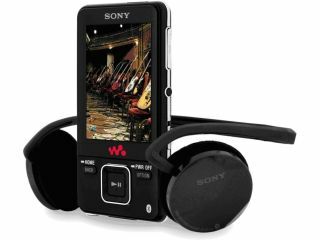 Sony has announced the latest addition to its Walkman media player range, with the NWZ-A820 Walkman Video MP3 player. Boasting a “large” 2.4 inch screen (its superlative) and the more impressive addition of wireless Bluetooth headphones, Sony’s latest will be available in April as it continues the fight with Apple for control of the portable media market. Available in 4GB or 8GB versions, the NWZ-A820 promises 10 hours of continuous video playback or 36 hours of music. Those come down to seven and 15 respectively when the Bluetooth stereo is enabled. The incorporated Bluetooth stereo allows users to stream music through a compatible stereo. And Sony has picked up a PlaysForSure certificate from Microsoft as well as getting the product certified for Vista. “We are continuing to add products to our Walkman portfolio that offer customers the flexibility and freedom to choose how they download and manage their digital music content, which only open standards can provide”, said Adam Williams, group product manager for Audio Marketing at Sony UK.